WTS-OC workshop/reception featuring Grace Crunican, Dana Hook, Mary Peters and Susan Martinovich. 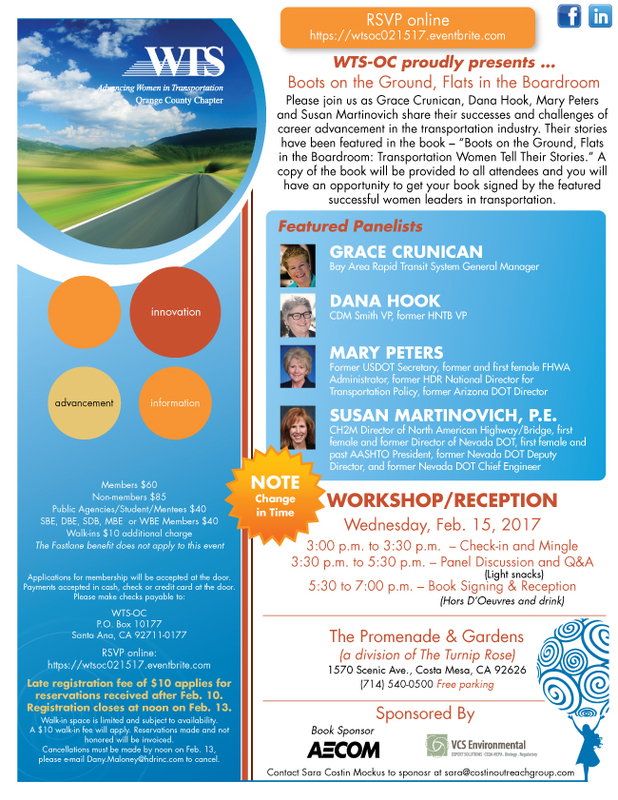 Please join us as Grace, Crunican, Dana Hook, Mary Peters and Susan Martinovich share their successes and challenges of career advancement in the transportation industry. Their stories have been featured in the book - "Boots on the Ground, Flats in the Boardroom: Transportation Women Tell Their Stories." A copy of the book will be provided to all attendees and you will have an opportunity to get your book signed by the featured successful women leaders in transportation. To see a larger image of the flier, please click here.